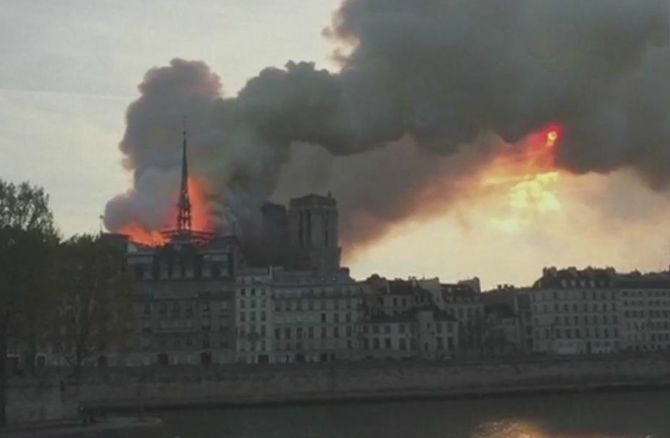 Paris Deputy Mayor said Spire of Notre-Dame cathedral collapses in huge fire. Former Defence Minister Manohar Parrikar's son Utpal on Monday described as 'insensitive' and a 'new low in Indian politics' Nationalist Congress Party chief Sharad Pawar's remark that the late Bharatiya Janata Party leader quit his post at the Centre and returned to Goa because he did not agree with the Rafale deal. In a strongly-worded letter addressed to Pawar, Utpal Parrikar termed Pawar's remark as another attempt to invoke his father's name to push 'blatant falsehood for political gains'. He said the Parrikar family was saddened to read the remarks of Pawar, himself a former defence minister. 'This is yet another unfortunate and insensitive attempt to invoke my father's name to push blatant falsehood for political gains,' Utpal Parrikar said. Addressing reporters in Kolhapur on Saturday, Pawar had said, "The Rafale deal was not acceptable to Parrikar. He therefore quit as Defence minister and returned to Goa." Parrikar, who took over as defence minister in November 2014, was sworn in as Goa chief minister on March 14, 2017. He died on March 17 this year after a long battle with a pancreatic cancer. Parrikar was the defence minister when the Rafale fighter jet deal was signed with France. In an apparent reference to Congress president Rahul Gandhi, Utpal said even when his father was alive and courageously fighting his illness, certain political leaders dragged his name in controversy for petty politics. 'That time, my father had given a fitting reply to such insinuations and innuendos. Today he is not amongst us, which is why perhaps you are taking the liberty to use his name and speak lies. This is a new low in the Indian political discourse,' Utpal wrote in the letter. 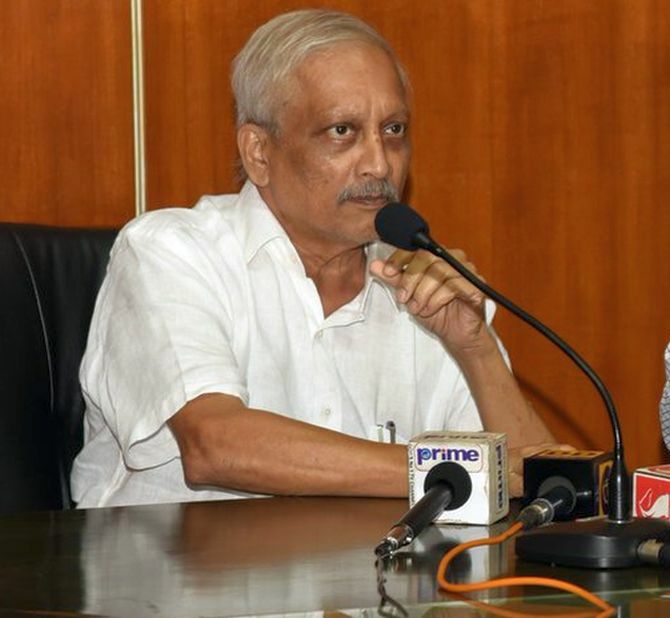 A controversy had erupted after Gandhi met ailing Parrikar in Panaji in January this year. After the meeting, the Congress chief said in Delhi that Parrikar had said he had nothing to do with the new Rafale deal. Parrikar had rebutted Gandhi's claim about the purported conversation between them. Utpal further stated that being a senior and respected politician, the people of India did not expect such a statement from Pawar. 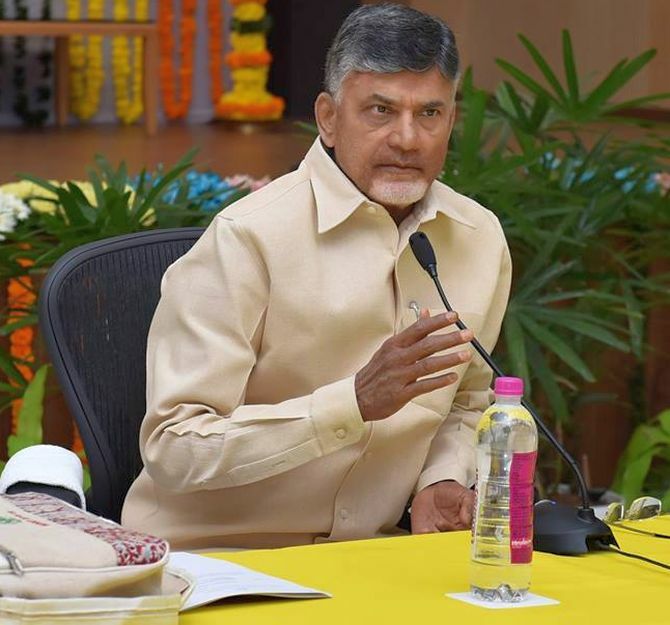 Andhra Pradesh Chief Minister N Chandrababu Naidu, key interlocutor among 21 opposition parties demanding verification of at least 50 per cent of polled votes against VVAPT slips, on Monday alleged the Election Commission was functioning under the 'guidance' of Prime Minister Narendra Modi and the Bharatiya Janata Party. Opposition parties on Sunday had held a meeting to discuss the issue of EVM malfunctioning and said they will approach the Supreme Court again to demand that at least 50per cent of paper trails be verified with EVMs. Naidu had met Chief Election Commissioner Sunil Arora on Saturday to raise the issue of alleged malfunctioning of EVMs. The Telugu Desam Party chief also asked the people of Karnataka to vote in favor of the Janata Dal (Secular)- Congress coalition candidates in the coming Lok Sabha polls. "Yesterday I met the Election Commission. All of you are here and I want to tell you one thing. This Election Commission is working under the guidance of Narendra Modi and BJP," Naidu said, addressing a public meeting in Mandya's Pandavapura. Alleging that the independent functioning of all constitutional organisations is under threat, he said, "We are all together to fight against EVMs...as of today EVMs are vulnerable." As many as 19 passengers, including eight women, exchanged sides as the weekly cross-LoC bus service resumed on Monday after remaining suspended for the past two weeks owing to heavy shelling along the Line of Control (LoC) in Poonch district of Jammu and Kashmir, officials said. Thirteen Pakistan occupied Kashmir (PoK) residents, including six women, returned to their homes after spending time with their relatives on this side after reaching Chakan-da-Bagh crossing point by the weekly bus, they said. Similarly, the officials said, five Indian residents, including two women, walked into this side along with a PoK resident who has come to meet his relatives in Poonch district. The bus service, popularly known as 'Paigam-e-Aman' (message of peace), plies on Monday every week. Billed as the biggest confidence building measure, the bus service was started on the Srinagar-Muzaffarabad route in Kashmir in April 2005 and the Poonch-Rawalakot route in the Jammu region on June 20, 2006, to facilitate travel between the divided families living on either side of the LoC. The cross-LoC trade between the two sides, which works on barter system, started in October 2008. However, the trade, which takes place four days a week from Tuesday to Friday, also could not take place during the past fortnight in view of the tension along the borders. Three persons, including a BSF officer and a five-year-old girl, were killed and 24 others injured in Pakistani shelling in the forward villages of Poonch on April 1, forcing the suspension of the bus service and the trade between the two sides. Five suspected Islamic State terrorists were arrested on Monday during a raid in Karachi, the capital of Pakistan's southern Sindh province, police said. Police conducted a raid on a compound in Karachi's Taiser Town on the basis of intelligence reports and arrested the suspected terrorists, a senior police official said. The official said that jihadi lliterature, weapons, hand grenades and bullets were recovered from their hideout. The ISIS on Saturday claimed responsibility for a suicide attack that killed 21 people and wounded more than 50 others in Quetta, the provincial capital of restive Balochistan province, in an attack believed to be targeting the minority Hazara Shia community. 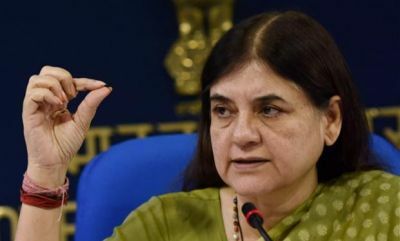 Election Commission bars Union minister and Bharatiya Janata Party leader Maneka Gandhi from campaigning for 48 hours for her communal remarks. A Mumbai-bound Vistara flight made an emergency landing at the Jaipur International Airport on Monday after an elderly passenger's health worsened mid-air, an official said. Vistara UK987 flying from New Delhi to Mumbai landed at the airport at 3.15 pm, Jaipur airport director J S Balhara said. He said a medical team at the airport was apprised about the medical emergency to handle the situation. Raza Hussain, 70, was referred to a nearby private hospital in an ambulance with a doctor. He was accompanied by his family member. The flight had 136 passengers on board and two of them were disembarked at the airport in Jaipur, including a relative of the patient. A Jammu-based activist has filed a complaint with the Election Commission against People's Democratic Party chief Mehbooba Mufti over her 'seditious' tweet as he demanded action against her for violating model code of conduct. He was referring to Mehbooba's tweet on April 8. 'Why waste time in court. Wait for BJP to scrap Article 370. It will automatically debar us from fighting elections since Indian constitution won't be applicable to J&K anymore,' she had tweeted. Activist Sukesh C Khajuria said he filed the complaint in the interest of free and fair elections and sought legal action against the former Jammu and Kashmir chief minister under relevant sections of the Representation of People Act, 1951, laws of the state, Information Technology Act and Model Code of Conduct violation. Mehbooba is fighting the Lok Sabha polls from Anantnag constituency. "Mehbooba, being a candidate for the Lok Sabha elections, has affirmed her oath in the Indian constitution, but her tweet is blatantly seditious, threatening unity and integrity of the country," Khajuria, who had been a part of prominent citizens advisory committee constituted by the state government, said. "Mehbooba has willfully tried to excite disaffection towards government of India, which is prima facie an offence of sedition. She has also committed an offence of promoting enmity between the classes punishable under the Ranbir Penal Code (RPC) and laws of the state, including IT Act 2002," he said. 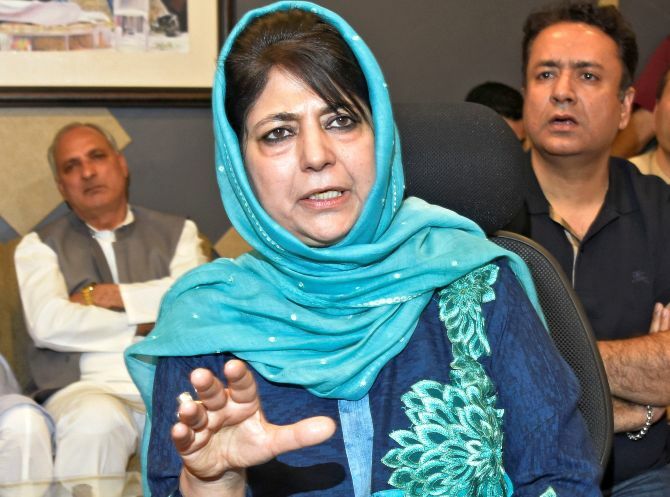 In his complaint, copy of which was also submitted to state Chief Electoral Officer Shailendra Kumar, the activist added that the 'seditious tweet' of Mehbooba was an 'incitement to violence' and 'public disorder'. Congress president Rahul Gandhi on Monday accused Aam Aadmi Party chief Arvind Kejriwal of doing an "U-turn" on the alliance talks between the two parties and said the doors of the Congress are open, but time is running out. 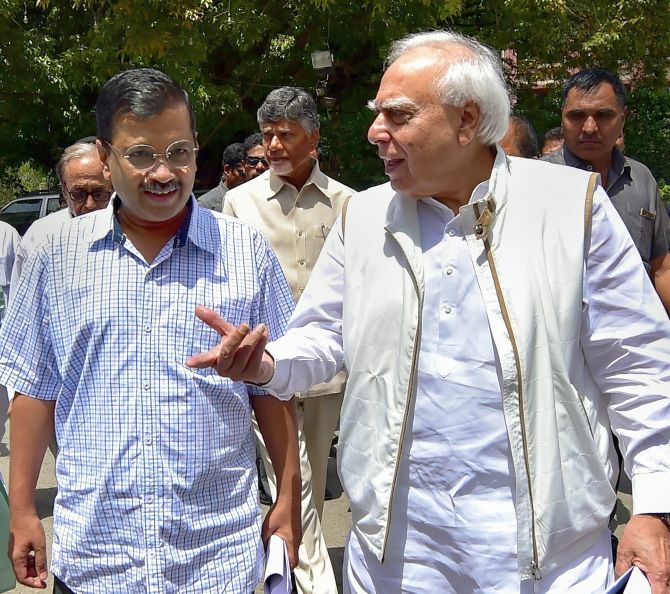 However, Kejriwal claimed that the talks are still on and accused Gandhi of helping the BJP by "dividing anti-Modi votes in Uttar Pradesh and in some other states"
The Congress president on Twitter said his party is willing to give four of the seven Lok Sabha seats in Delhi to the (AAP) to ensure that the their alliance defeats the BJP. "But, Mr Kejriwal has done yet another U turn. Our doors are still open, but the clock is running out," Gandhi tweeted. Hitting out at Gandhi on Twitter, Delhi Chief Minister Kejriwal said, "What U-turn. The talks are still on." "Your tweet shows that an alliance is not your desire but only a pretension. I am pained that you are giving mere statements," he said. 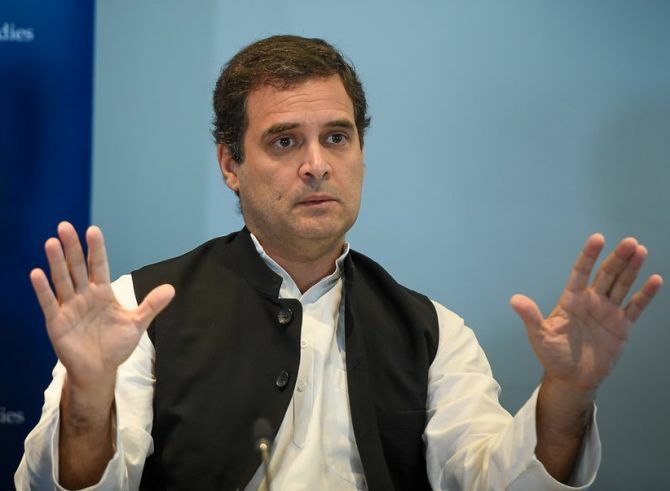 The Supreme Court Monday made it clear that remarks made by Rahul Gandhi in the media on the Rafale case verdict were "incorrectly attributed" to the apex court and directed the Congress President to give his explanation by April 22. "Having clarified the matter we deem it appropriate to seek explanation of Gandhi," the bench also comprising Justices Deepak Gupta and Sanjiv Khanna said. 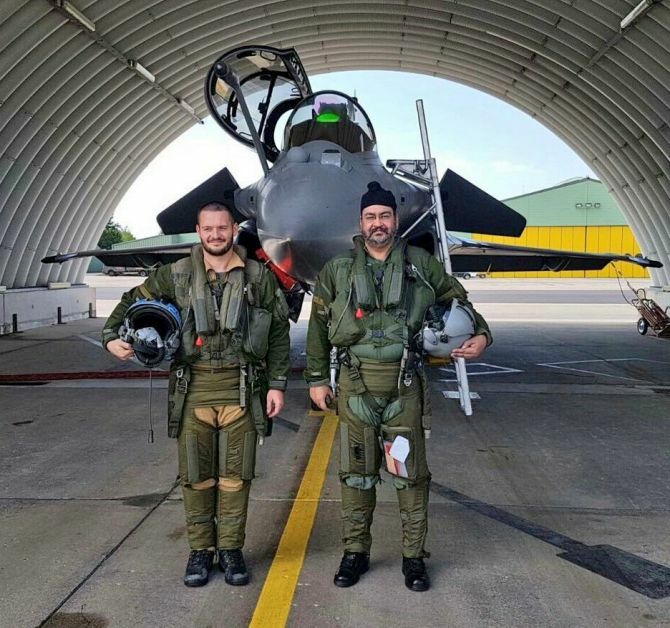 Technology was on India's side in the Balakot air strikes, Air Chief Marshal B S Dhanoa said on Monday, asserting that the results would have been further tilted in the country's favour if Rafale jets were inducted in time. The event was hosted by the IAF along with the Centre for Air Power Studies, an autonomous defence research and analysis body. 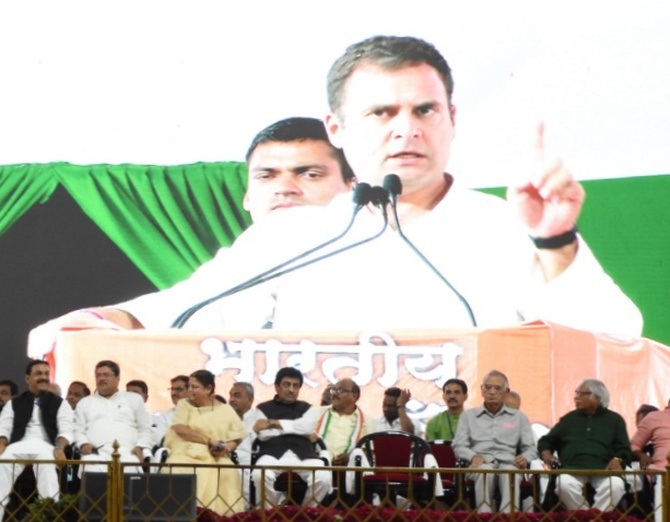 Addressing a rally in favour of Congress nominee Raj Babbar from Fatehpur Sikri, which goes to the polls in the second phase on April 18, Gandhi said, "Everywhere it is the publicity of Narendra Modi. Where is the money coming from? Thirty seconds on TV or newspaper advertisements require lakhs of rupees. Who is giving the money for it? It is not coming from Modi's pocket." Attacking Modi over his "failed" promises, Gandhi said the prime minister had lied to the youth about generating two crore jobs and to the people of India about putting Rs 15 lakh in everyone's bank account. Elaborating on the "Nyay" scheme promised by the Congress, Gandhi said he had consulted economists on extending financial help to the poor people without disturbing the economy and was given the figure of Rs 72,000 per annum. 17:44 The Story of Our Ancestors and Where We Came From: Interview : Senior journalist, Early Indians: The Story of Our Ancestors and Where We Came From is not the typical Indian journalist's idea of a book. It is not an egotistical trip down memory lane; it is not a lazy compilation of previously published columns; it is not airy-fairy drawing-room gossip passed off as wisdom. It is science. 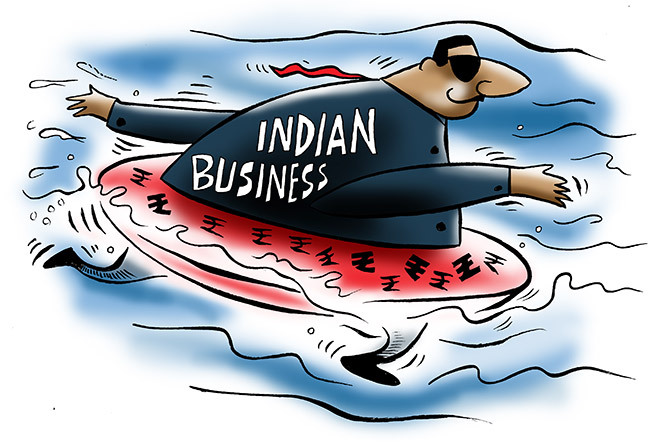 17:30 Falling NPAs can give a 60-bps booster shot to GDP this fiscal: The rise in banks' profitability, thanks to a steady decline in dud assets, can give a 0.60- percent boost to GDP in fiscal 2020, says a report. This will be possible due to the rise in profits on the back of a decline in credit costs, which is the money that banks set aside to deal with bad loans, will help banks lend more money to productive purposes, it said. "The fall in credit costs implies a positive supply impact of 1.40 percent to credit growth, which can boost real investment growth by 2 percent and real GDP growth by 0.60 percent financial year," a report by American brokerage Goldman Sachs said Monday. 17:24 This is what the IMD forecast for the monsoon looks like. Prime Minister Narendra Modi requested Union Finance minister Arun Jaitley to cut short his foreign trip and return to India and accordingly, Jaitley returned from the US where he was attending the World Bank and International Monetary Fund meetings. The ostensible reason for Jaitley to be summoned is that the PM wants him to coordinate between the BJP and the RSS and guide BJP spokespersons on a day-to-day basis on what should be articulated on TV debates which reflects the party's and the PMO's views. Jaitley plays an important role by acting as an intermediary and a conduit of information between the RSS cadre and the Prime Minister. During the poll season, Jaitley is also tasked with monitoring advertisements in the print and TV media. The minister has to also liase with the Election Commission. Jaitley is close confidante of the PM and offers quick solutions to political matters. Helping Jaitley union minister Nirmala Sitharaman, both of who have been tasked by party president Amit Shah. Both the ministers arrive at the BJP headquarters by 11 am, meet party workers, ensure that the publicity materials reach candidates. When elections are around the corner, it's all hands to deck. 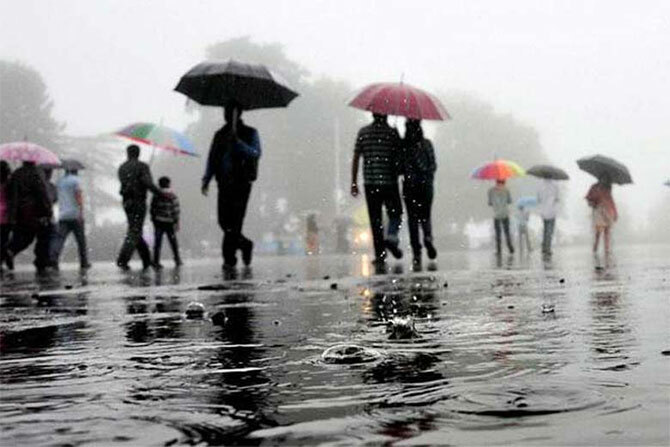 16:49 Rain check: Monsoon to be near normal, says MeT : The southwest Monsoon, which brings rainfall to India during the months of June to September, is likely to be "near-normal" this year with weakening El Nino weather pattern predicted. The Indian Metrological Department (IMD) on Monday predicted that quantitatively, the monsoon seasonal (June to September) rainfall is likely to be 96 per cent of the Long Period Average. The forecast has a model error of 5 per cent, according to the weather department. "Weak El Nino conditions are likely to prevail during the monsoon season with reduced intensity in the later part of the season. "Overall, the country is expected to have well-distributed rainfall scenario during the 2019 monsoon season, which will be beneficial to farmers in the country during the ensuing Kharif season," added the weather forecaster. The monsoon is critical to India's agriculture as it accounts for more than 70 per cent of the country's annual rainfall. 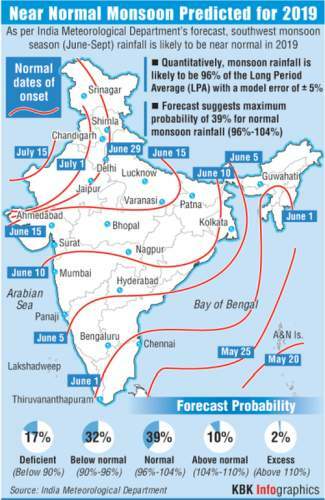 The IMD defines average, or normal, rainfall as between 96 percent and 104 percent of a 50-year average of 89 centimetres for the entire four-month season beginning June. 16:20 Kuch meetha ho jaye? : Union Minister Smriti Irani drinks sugarcane juice while campaigning in the Amethi constituency. 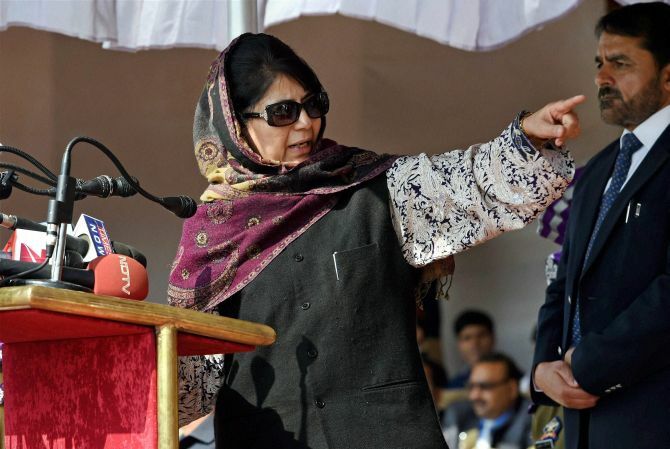 15:56 Modi did drama of Balakot attack: Mehbooba: PDP chief Mehbooba Mufti on Monday claimed that the BJP is creating insecurity among people in order to carry out another Balakot-like attack to garner votes. Speaking to reporters, Mufti said, "Narendra Modi has failed in all his attempts. He tried to incite communal violence and create polarisation here. He also did drama of Balakot attack. Now they can see their defeat in the first phase of elections. He is creating a sense of insecurity among people and it seems that they are planning another attack on Pakistan so that they get votes in the other phases. "She also claimed that everything BJP is doing today is only for votes. "Be it attack on Pakistan or strictness in Kashmir, it is all vote politics and nothing else," she said. Mufti also said that a lot of questions have been raised on the Pulwama attack and how it happened. "I feel that complete inquiry must be done to reveal the full truth," she opined. 15:47 Ravi Kishan to contest from Gorakhpur : Lok Sabha Elections 2019: BJP announces list of seven candidates for Uttar Pradesh: Ravi Kishan to contest from Gorakhpur and Praveen Nishad to contest from Sant Kabir Nagar (Sharad Tripathi is the sitting MP from Sant Kabir Nagar). 15:33 Threat to my life, says Urmila after BJP-Cong clash: Reacting sharply to a scuffle between Congress workers and BJP sympathisers earlier today, actor-turned-politician Urmila Matondkar claimed that there is a threat to her life and she requires protection from the police. Speaking to ANI after the scuffle that took place during her roadshow at Borivali, Matondkar said, "It is being done to create fear. It is just beginning, it will take a violent turn. I have asked for police protection. There's a threat to my life, I have filed a complaint." Talking about the scuffle that happened earlier in the day, Matondkar said, "We were peacefully addressing people and from nowhere 15-20 people came and started raising slogans in favour of Prime Minister Narendra Modi. Initially, I didn't react to it and thought these kinds of things keep happening. But they all started making vulgar actions and started dancing. They were trying to intimidate women at the back. They were moving forward towards the direction where my vehicle was standing. Because of this, our people had to intervene and asked them to stop doing this. A clash then broke out between them and they even hit some women." She also said that she has filed a police complaint on today's incident. Matondkar has been fielded by Congress from Mumbai (North) constituency. Image: Urmila Matondkar tries her hand at cricket at Sahyadri Nagar, Charkop in Kandivali. 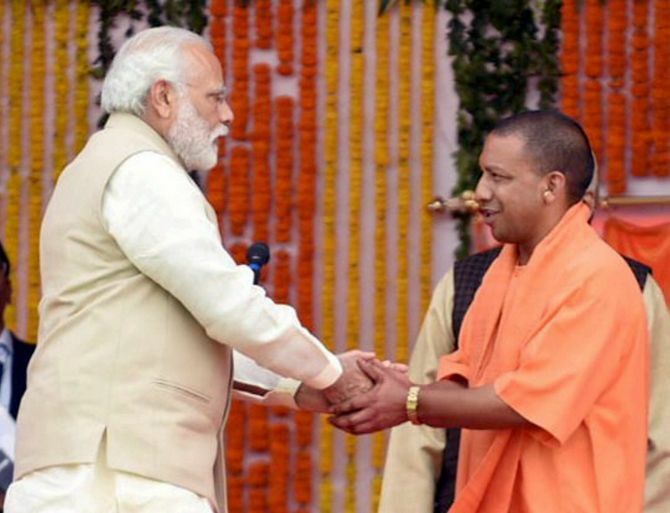 14:53 EC bans Yogi from campaigning for 3 days, Maya 2 : IN a strong move that should send out a clear message to other politicians as well, the Election Commission bans UP CM Yogi Adityanath and BSP chief Mayawati from election campaigning for 72 hours and 48 hours respectively. The ban begins at 6 am tomorrow and has been slapped on them for violating the Model Code of Conduct by making objectionable statements in their speeches. This means no road shows, rallies, interviews, public statements or social media posts. The Election Commission's action comes after Yogi Adityanath's speech at a rally in Meerut, where he said, "If the Congress, the SP and the BSP have faith in Ali, then we too have faith in Bajrangbali. As for Mayawati, she had made an appeal to Muslim voters in Uttar Pradesh's Saharanpur and Bareilly districts during the first joint rally of the BSP-SP alliance in Deoband on April 7. She had cautioned voters, "particularly Muslims", against splitting their votes in the eight western UP seats that went to polls in the first phase on April 11. 14:03 NCW issues notice to Azam Khan over his remarks against Jaya Prada: The National Commission for Women Monday strongly condemned the "extremely derogatory' remarks made by SP leader Azam Khan against actor-turned politician Jaya Prada and issued a show cause notice to him. Citing news reports, the NCW said the alleged remarks made by him were "offensive, unethical and show disrespect towards dignity of women'. "The Commission strongly condemns such irresponsible and disparaging comment on the matter. You are required to provide a satisfactory explanation to the Commission on the matter,' NCW Under Secretary Barnali Shome said in the notice. National Commission for Women Chairperson Rekha Sharma on Sunday termed Khan's below-the-belt remarks against the actor as "extremely disgraceful". Reacting to Khan's alleged remarks, she tweeted that the NCW would also be requesting the Election Commission to bar him from contesting elections. Sharma took cognisance of another tweet by an user, who had uploaded a video of the SP leader's purported jibe. The video of Khan making the "abusive" remarks was doing rounds on various social media platforms. "I brought her (Jaya Prada) to Rampur. You are a witness that I did not allow anyone to touch her body. It took you 17 years to identify her real face but I got to know in 17 days that she wears khaki underwear," Khan said on Sunday. 13:53 Shashi Tharoor has got his groove back after injuring himself in Thiruvananthapuram: A Vishu break from the paryadanam circuit! Campaigning in the heat (46 degrees C ydy) comes straight out of a cookbook -- one is roasted in the morning, slow-baked in the afternoon & (esp in the coastal areas) steamed in the evening. Once the rains start, one will be poached too! 13:45 Priyanka calls out BJP's 'fake nationalism': Congress general secretary Priyanka Gandhi Vadra addresses a rally in Fathepur Sikri. Congress President Rahul Gandhi and general secretary Jyotiraditya Scindia were with her at the rally. Rahul will also address a rally in Agra, followed by a rally in Gujarat's Bhavnagar before speaking at another rally in Maharashtra's Nanded. At the Fatehpur Sikri rally, Priyanka Gandhi said, "You are aware of the falsehood being presented during the (BJP) campaigning. BJP leaders say they are nationalist. If you claim to be nationalist, then please respect those who have given the color to the Constitution. If you are a nationalist, then stop speaking about Pak in your campaigns." 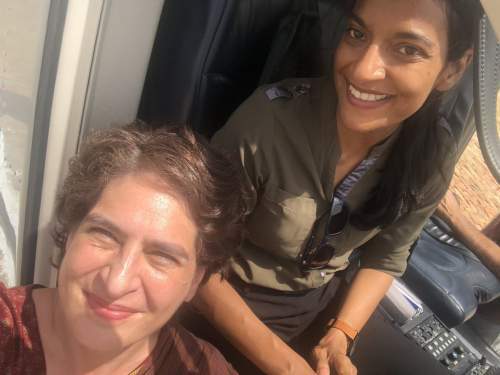 Image: Priyanka Gandhi Vadra posted this image on Twitter saying, "So proud to be flown by a lady today, that too in a chopper!" 13:14 Bloody but battle-ready. 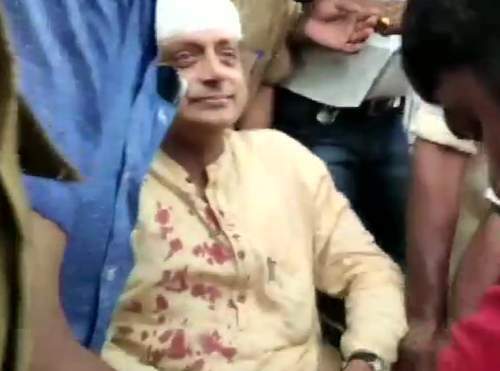 Thiruvananthapuram MP Shashi Tharoor was injured while offering prayers at a temple in his constituency. 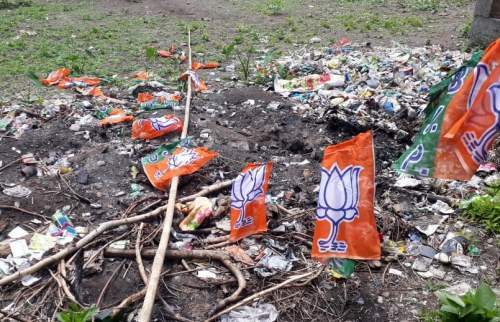 13:01 BJP booths vandalised in Siliguri: IN Siliguri, West Bengal, three booth offices of the BJP have been vandalised by unidentified miscreants last night. 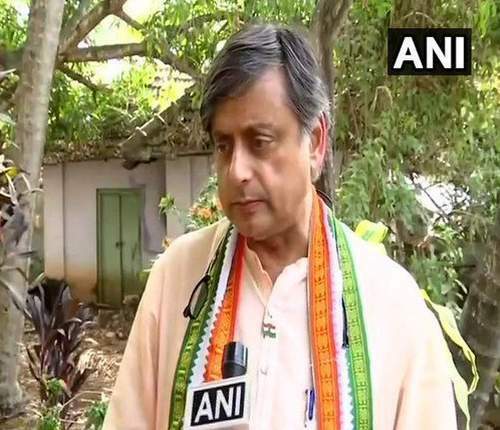 12:48 News updates at this hour : Kerala: Congress MP Shashi Tharoor has been injured while offering prayers at a temple in Thiruvananthapuram and has been shifted to General Hospital there. He has suffered injuries on his head and has received 6 stitches. Doctors says he is out of danger. Nirbhay missile: Today India's 1,000 km strike range sub-sonic cruise missile 'Nirbhay' was successfully test fired off the coast of Odisha. March Wholesale Price Index (WPI) inflation stood at 3.18% (provisional) as compared to 2.93% (provisional) for the previous month. The Supreme Court Monday made it clear that remarks made by Rahul Gandhi on the Rafale case verdict were "incorrectly attributed" to the apex court and directed the Congress President to give his explanation by April 22. The apex court said it will consider the petition filed by BJP MP Meenakshi Lekhi seeking contempt action against Gandhi for attributing some observations to the apex court which was not in the Rafale judgement. The bench also comprising Justices Deepak Gupta and Sanjiv Khanna said, "Having clarified the matter we deem it appropriate to seek explanation of Gandhi." 11:57 Rajasthan CM demands sedition case against Yogi: Rajasthan Chief Minister Ashok Gehlot has demanded that a sedition case be registered against his Uttar Pradesh counterpart Yogi Adityanath for calling the armed forces 'Modi ji ki sena'. "Yogiji is saying this is Modi sena. There should be a case of sedition registered against Yogi ji. If someone criticises the government, the person is immediately called anti-national. But who is the anti-national...The (UP) Chief Minister says 'Modi ji ki sena hai'' (Prime Minister Narendra Modi's armed forces). Where do you want to take the country," he told reporters on Sunday. Gehlot said that while people are proud of the bravery of the armed forces, this is the first time the services are being politicised. "In Pakistan, the military has ruled repeatedly. However, in our country, we have kept the armed forces away from politics for the last 70 years. This is the first time when attempts are being made to politicise the services. The day the Army starts interfering in the country's internal affair as in Pakistan, what will happen? Our Army does not think that way. It carries out the job of protecting the country," he said. 11:33 'The common man does not elect the PM': "One big leader said you might get 3 lakh votes and still lose. 'I said if I do, I will make sure you are sleepless because it will be me and three lakh people." 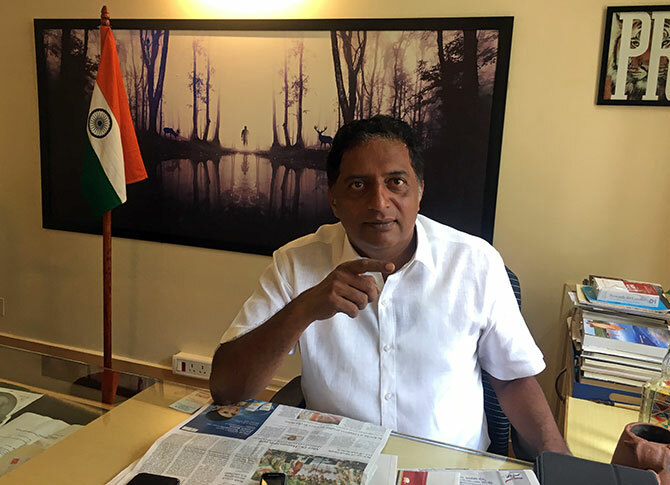 Rediff.com's Archana Masih meets Prakash Raj, actor and Lok Sabha candidate in Bengaluru Central. Read the interview here. 11:31 Will Sonakshi join politics? She says...: "I am as aware as I should be about politics. It is something I don't have the aptitude for. A lot of people ask me about joining politics and I tell them that just because my father is politician, doesn't mean I should be a part of it.I am happy with films." 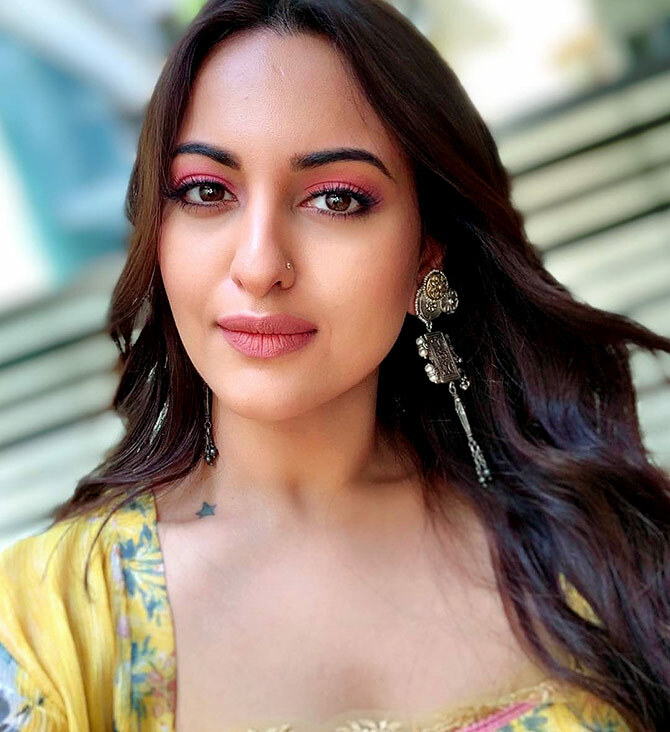 Sonakshi Sinha on her parents, and of course, the upcoming film, Kalank. 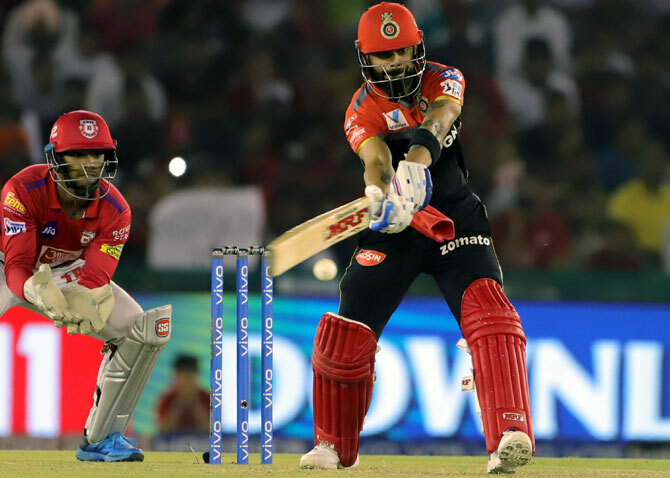 Read the interview with Rediff.com's Patcy N here. 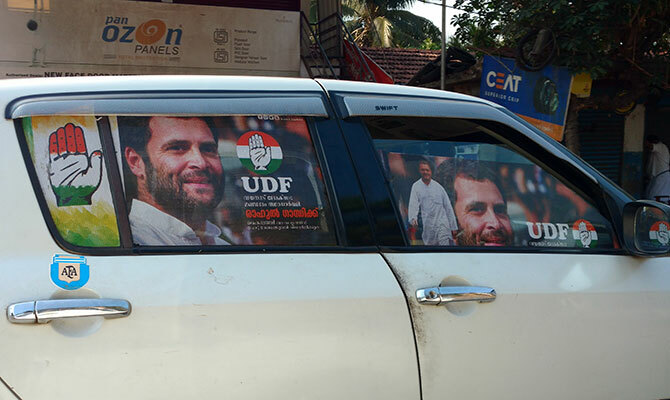 11:24 'Wayanad will be Rahul's Waterloo': Unlike the LDF and NDA nominees who are at ground zero and campaigning hard every day, the Congress candidate's campaign is undertaken in absentia, dependent on an army of local and imported from the rest of Kerala Congresswomen and men. Rediff.com's Nikhil Lakshman reports from Wayanad. Read the report here. 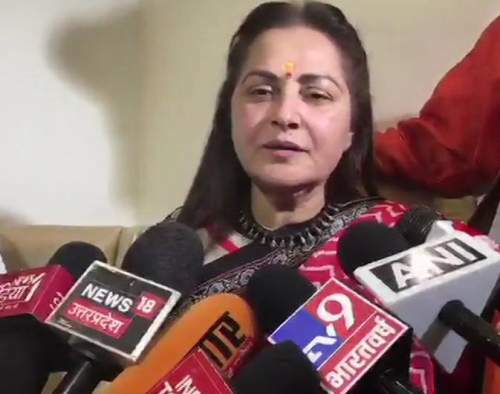 10:34 Won't get scared and leave Rampur: Jaya Prada: 1st reactions: Jaya Prada on Azam Khan's remark: "It isn't new for me. You may remember that I was a candidate from his party in 2009 when no one supported me after he made comments against me. I'm a woman and I can't even repeat what he said. I don't know what I did to him that he is saying such things." "He shouldn't be allowed to contest elections because if this man wins, what will happen to democracy? There'll be no place for women in society. Where will we go? Should I die, then you'll be satisfied? You think that I'll get scared and leave Rampur, but I won't." In 2009, things had turned sour between Azam Khan and Jaya Prada as he former was angry over Amar Singh's influence on her, and Khan held Singh responsible for what he termed a "disastrous" tie-up between Mulayam Singh and Kalyan Singh. Khan blocked Jaya Prada's ticket but ended up being expelled from the SP for anti-party activities. Jaya Prada won, albeit with a lesser margin of 31,000 votes, thanks to Khan actively working to ensure her defeat. 10:13 Swaraj seeks 'Bhishma's' response on Azam's khaki undie remark: Drawing a comparison between mythological character Bhishma Pitahmah and Samajwadi Party (SP) founder Mulayam Singh Yadav, Union Minister and BJP leader Sushma Swaraj on Monday sought Mulayam's response on the 'Khaki underwear' comment made by his party leader Azam Khan against film actor and Rampur BJP candidate Jaya Prada. Referring to Draupadi's cheer-haran (disrobing) - a scene from epic Mahabharata in which Pandavas lost a bet to their usurping cousins - Swaraj appealed to Mulayam to not remain silent on the matter. "Mulayam Bhai - You are the father figure of Samajwadi Party. In front of you, Draupadi is being disrobed in Rampur. 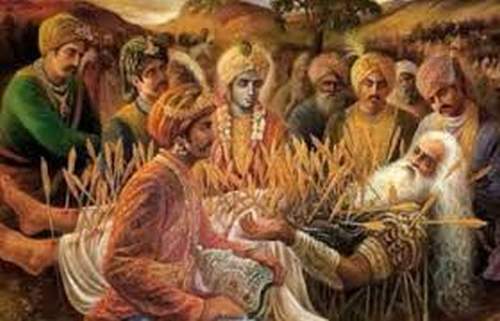 Do not make the mistake of being silent like Bhishma@yadavakhilesh Smt. Jaya Bhaduri, Mrs.Dimple Yadav," she tweeted in Hindi. 09:59 Rupee slips 7 paise to 69.24 vs USD in early trade: The rupee fell 7 paise to 69.24 against the US dollar in opening trade Monday on increased demand for the greenback from importers and banks. Forex dealers said strengthening of the American currency in the overseas market weighed on the domestic unit. The rupee opened strong at 69.07 at the interbank forex market, then lost ground and fell to 69.24 down 7 paise over its last close. The rupee had settled at 69.17 against the US dollar on Friday. Foreign institutional investors remained net buyers in the capital markets, putting in Rs 897.45 crore Friday, as per provisional data. Meanwhile, brent crude futures, the global oil benchmark, fell 0.14 per cent to trade at USD 71.45 per barrel. 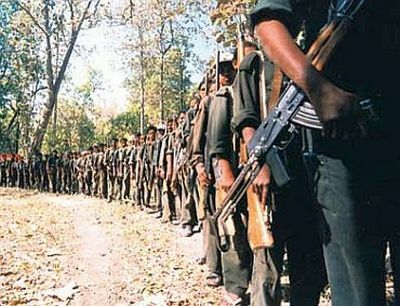 Three Maoists and a CRPF jawan were killed in an encounter in Jharkhand's Giridih district on Monday, officials said. They said the encounter between the two sides took place around 6 am in the forests of Belbha Ghat area of the district when troops of the 7th battalion of the Central Reserve Police Force were undertaking operations. The Supreme Court will hear a petition filed by the producers of "PM Narendra Modi" against the ban imposed by the Election Commission. 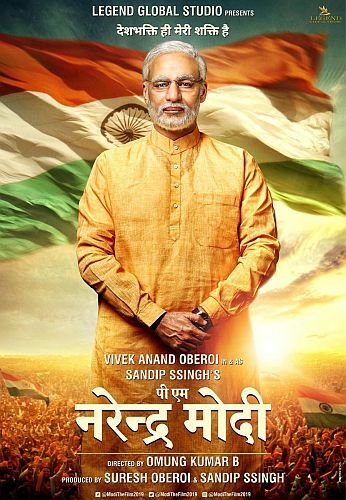 In a democracy, it's important to allow freedom of expression, says "PM Narendra Modi" producer Sandip Ssingh, urging the Supreme Court to view the film as an "inspiring story" rather than "political propaganda". Ssingh said in a statement: "Every citizen of India has the right to appeal for justice and that's what I am doing as the producer. For me and the entire team, this film is special and we want the world to see it." 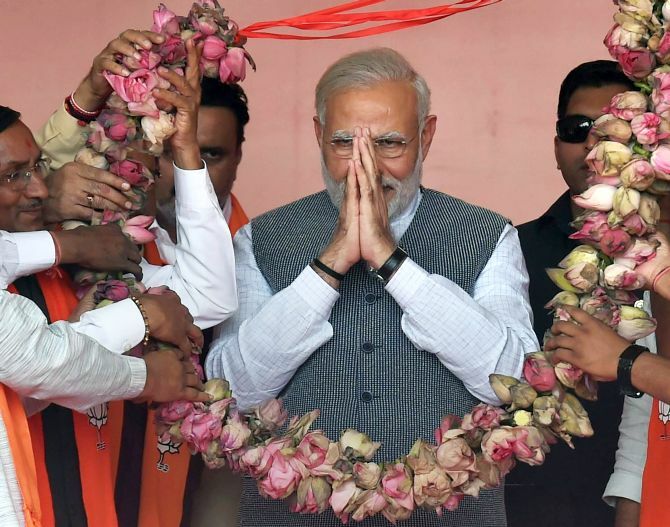 The EC had stalled the release of a film on Prime Minister Narendra Modi until the polls end, asserting that any biopic material with the potential to disturb the level-playing field during elections should not be displayed. Azam Khan, the Samajwadi Party strongman, taking on BJP's Jaya Prada in Uttar Pradesh's Rampur constituency claimed that he will not contest the elections if anyone can prove that he named his actor-turned-politician opponent, in a campaign speech where he said, "...the underwear beneath is of the khakhi colour." "I will not contest the polls if proven guilty... 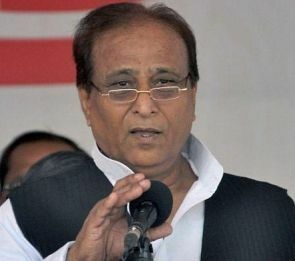 I haven't named or insulted anyone and I know what I should say," Azam Khan said on the crude remarks, allegedly made against Jaya Prada at an election rally on Sunday. 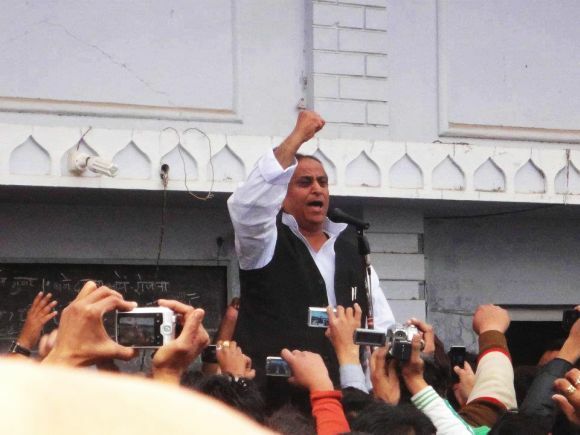 "I was a nine-time MLA from Rampur and have been a minister. I know what to say," the SP leader said. Azam Khan claimed that he made the remarks in the context of a "man" who had apparently said that "he brought 150 rifles with him" and if he sees Azam Khan, he would shoot him. Without naming who he was referring to Azam Khan said, "Now, it has been revealed that he has an RSS pant on his body. Shorts are worn by men." The SP leader yesterday at a rally said, "...I want to ask you, should politics stoop so low? Ten years the person sucked the blood of Rampur , I held that person's finger and brought the person to Rampur. I made her familiar with the streets of Rampur. I didn't let anyone touch her. No dirty words were used. You made the person your representative for 10 years. But what is the difference between you and me. Rampur waalon , Hindustan waalon, uski asliyat samajhne main aapko 17 baras lag gaye (understanding the person's real face you took 17 years). 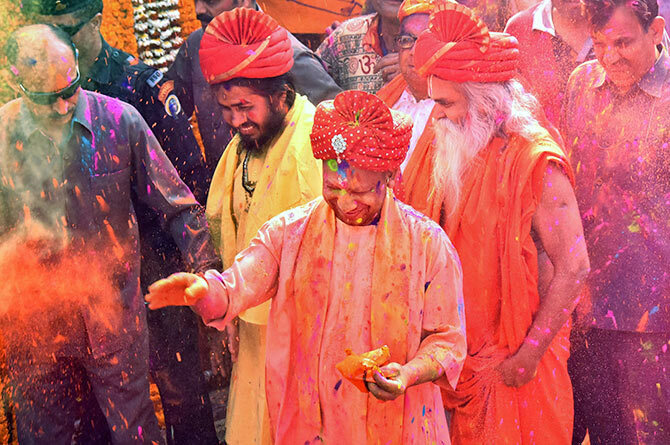 I realised in 17 days, that the underwear beneath is of the khakhi colour." Azam Khan's remarks were allegedly targeted at Jaya Prada, who last week alleged that she left Rampur after her "indecent images" were circulated and attempts were made to attack her with acid. The BJP and its ally JD-U, strongly criticised Azam Khan's remarks. "This type of language is unacceptable...using such words for women is shameful, we condemn this statement. Azam Khan should apologize," demanded senior JD-U leader Pawan Verma. 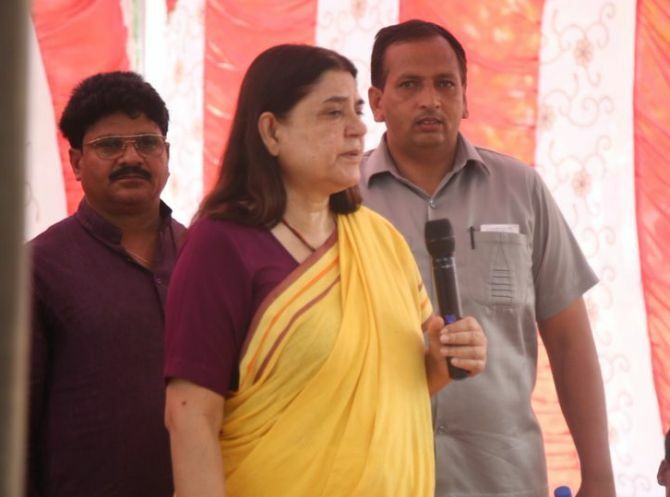 Union Minister and BJP leader Maneka Gandhi made another controversial statement in a rally in Sultanpur. She announced the ABCD category system to demarcate voters and accordingly reward them after the elections. According to Maneka Gandhi's proposed idea, those villages which cast 80 per cent votes to the BJP will be under category A. Those which cast 60 per cent votes in favour of BJP will be category B. "When the work will begin, 80 per cent of the work will be done for category A villages, then 60 per cent for the rest of the people," Maneka Gandhi said. The statement comes just a day after a video went viral on social media which showed Maneka Gandhi telling a group of Muslims to vote for her in the upcoming Lok Sabha elections 2019 or else they would not receive any help when she is the lawmaker. Maneka Gandhi was addressing a gathering in Uttar Pradesh's Sultanpur, where she is contesting on a Bharatiya Janata Party ticket.